All me look for new tyres, I currently have grabber ATs, (cant remember whether they’re AT2s or AT3s) which I quite like, the road/off-road bias is perfect for me. Having a look on andys website, I’ve found some Michelin attitude crosses, which aren’t all that dissimilar in price, and more importantly come with a C graded road efficiency rating. I understand they were OEM on pumas. Currently interested on their bias and how they look, the representative photo of the tread looks thin. Anyone have any photos or experience with them? Got boosts now but might upgrade to bowler 16’s to knock two birds in one stone. I've got them on mine. Getting close to due changing and have just been looking at alternatives but to be fair they've been great. I believe they were the ones it rolled out of the factory on and just about done 44k miles later. My driving is mostly roads but most days I'll have to venture into a muddy field and only once needed a tow when I went up to my axles in a bog. Rarely even needed to engage the diff. Watching thread with interest, looking at replacing my ageing gg trs soon and more or less committed on conti cross contacts, however I do like the even more understated look of Michelin latitudes and drawn to the better fuel economy rating. What do these ratings actually translate to in the real world though? Currently happy with the current fuel consumption with trs and would rather not lose too much due to a tyre change. My 2014 110 van has the standard steel wheels and those Michelins on it (7.50 R 16 I think). My first set lasted about 27500 miles and were still legal (but not for much longer) when I replaced them with exactly the same ones. I usually have perhaps 1/4 ton of kit in the back. The best MPG I've ever had was 28.5 (the 0.5 is very important!) on a long mainly motorway run with just my wife and me in an empty van. Normally it's closer to (very) early 20s. I've had no worries with grip with the Michelins in winter or summer, and it's used every week day all year round, but I don't go off tarmac at all. I use the Michelins in 7.50R16 and have been averaging 31MPG over the last couple of months on my commutes with cheap diesel, I have had 36 on long trips through Europe on premium diesel, summer does tend to be a little better. They are not an agressive tread, but actually remarkably impressive off road. Don't fall in to the trap of thinking a wide tyre helps you off road, quite the contrary. Wide tyres have to move more stuff out of the way so most of the time perform worse. Where wide tyres are an advantage is when you're going round corners, but Defenders aren't really designed for that Not to say that you'll never get stuck with 7.50s but they'll get you further than you'd think. When driving in Morocco last year, a friend with a heavier Defender than mine but with a remap more than making up for it struggled a lot more on dunes with his 285s than my 7.50s. Where I did want his tyres were on rocks, as the Latitudes are not as tough as a full mud tyre. However... the last time I was tyre shopping I found that the Michelins were substantially more expensive than other tyres and that being the case I wouldn't choose them over something like a Cooper AT3. You'll also find that if you've got alloys the tyres are too narrow. They'll fit on the standard steel wheels or on Wolfs (5.5" and 6.5" respectively) but the Boosts are 7" wide which is too much. 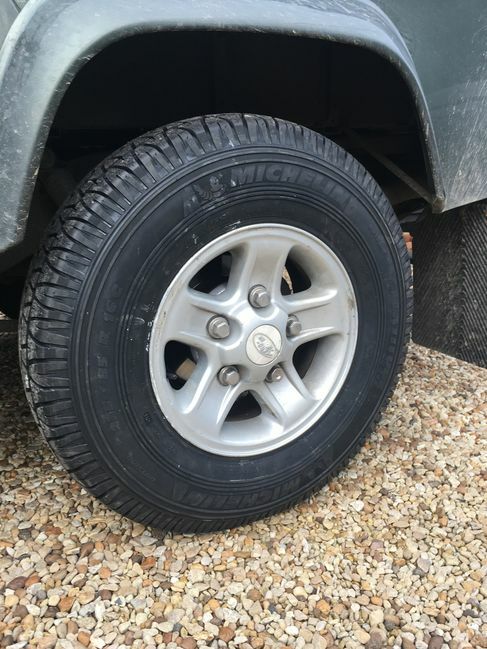 Ran them on my last D2 & they were more than up to the job (255/65R16) & also on my last Freelander where they had done 50k+ miles before I sold the car. They get my vote. Don't fall in to the trap of thinking a wide tyre helps you off road, quite the contrary. Wide tyres have to move more stuff out of the way so most of the time perform worse. I'm really happy with this tyre, particularly with its good road manners (wet/dry grip, braking, cornering, comfort and noise) and would certainly buy them again for my type of driving. However, I have a second set of Boosts in case I want to do heavy offroading, particularly in wet mud or slippery circumstances. I guess the same is true of bits of Scotland and Wales. Two tyres running the same tyre pressure will sink in exactly the same amount. The narrow one will have a long contact patch, the wide tyre will have a short contact patch. The dunes I was driving in last year were bottomless sand, if you stopped and span your wheels you'd have buried yourself up to your axles in short order. I ran a set of the Lattitudes in 7.50 flavour on mine for a while. Good tyre, surprisingly good off road (so long as you keep away from deep mud) and fine on the road. However they don’t last very long and are expensive for what you get. As such I switched to BFG All Terrains, which not only last far longer (I got ~72k from the last set) but are no worse for fuel economy or road noise in my experience. And better off road, with a more robust sidewall and tread. I switched to them about 6 months ago. Previously I had whatever the standard chunky tyre was that came with the black pack at the end of production. Surprisingly quiet with very little road noise. I've not noticed any measurable change in fuel consumption which has been a bit of a disappointment. There was a brief improvement, but checking back it was just the time I accidentally filled up with premium diesel. My main reason to switch was just how poor the chunkies were in the snow. Not used these enough in snow to judge yet. It should be noted that the Michelins do not have the 3 peak mountain snowflake symbol but the BFG KO2 does. Given a choice of 7.50 or 235 I'd choose 7.50, but given a choice of BFG KO2 or Michelin Latitude I'd go BFG (or Cooper).